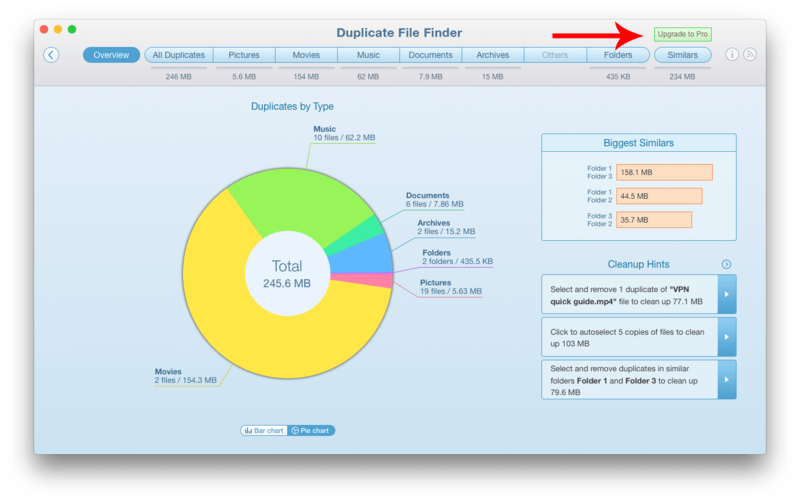 Duplicate File Finder is free to download from the App Store and allows you to find and remove duplicate files. It also has a PRO mode that is available with in-App Purchase and provides even more features. Let’s take a look at them. Click the green Upgrade to Po button from the top right corner of the app’s window. You will see a pop-up window. Click the button with the price $9.99. In the window that appears, enter your Apple ID username and password, and click Sign in. That’s all. You will understand that the in-app purchase is completed as soon as the green button and lock icons next to the features disappear. If, after this action, nothing has been changed, then reboot your Mac → launch the app → click again Upgrade to Pro → click Restore. If you still have questions, read the article “How to upgrade to Pro” or ask us at [email protected]. We are here to help you.